Chugging a can of beer was easy when you were younger, but now that you’ve upgraded to bottled beer, shotgunning is much harder. 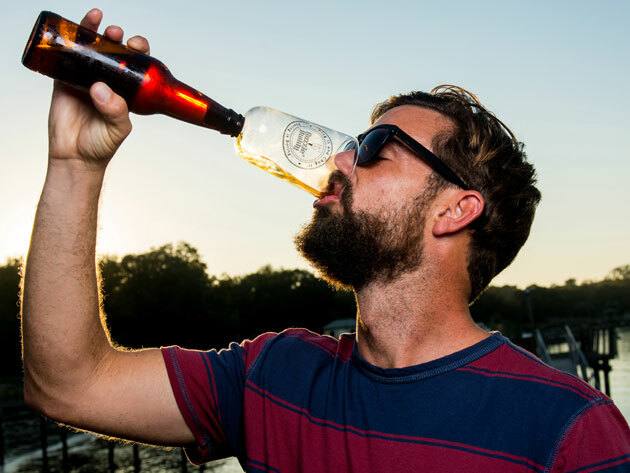 Enter the Guzzle Buddy Beer Bottle, a drinking man’s new best friend. The Guzzle Buddy screws on to any bottle so you can down a beer just like you used to. The device is now a quarter of its original price in the Daily Caller shop. Shotgunning a can, sure. But bottles? With this tool you can! The Guzzle Buddy Beer Bottle is perfect for tailgates, Monday Night Football, or just to impress your friends. The bottle attachment is freezer safe so pop it in before the big game to enjoy a frosty drink. Simply toss it in the dishwasher when it needs to be cleaned. The Guzzle Buddy makes the perfect gift (or gag gift) for the beer aficionado in your life. For only $11, less than the price as a six-pack of Bud Light, it can be yours. Upgrade your drinking game by purchasing the Guzzle Buddy Beer Bottle in the Daily Caller shop. The price has been reduced from $14.99 to $11. Save an additional 15% with the discount code MADNESS 15 bringing the final price to $9.35.